The cast of HENRY IV, PART 1. Photo by PAT JARRETT. 2014. 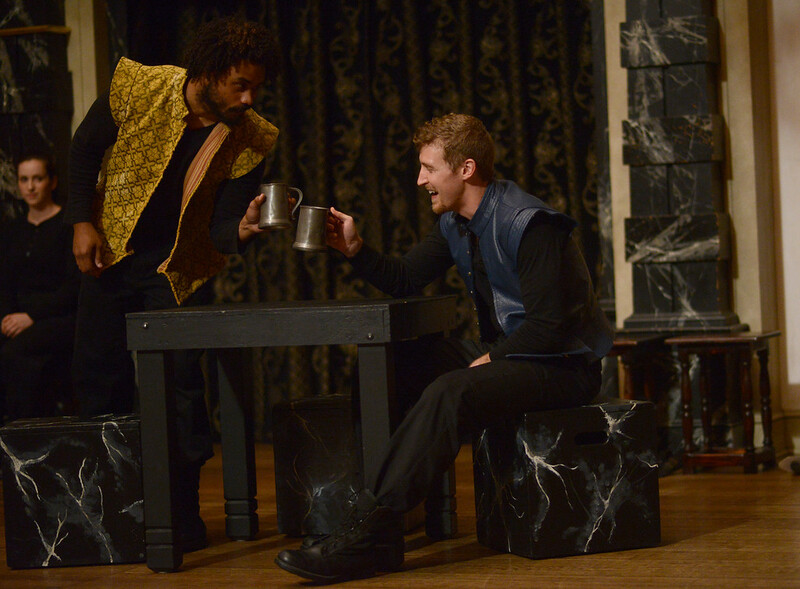 Fernando Lambery and Patrick Earl in HENRY IV, PART 1. Photo by PAT JARRETT. 2014. 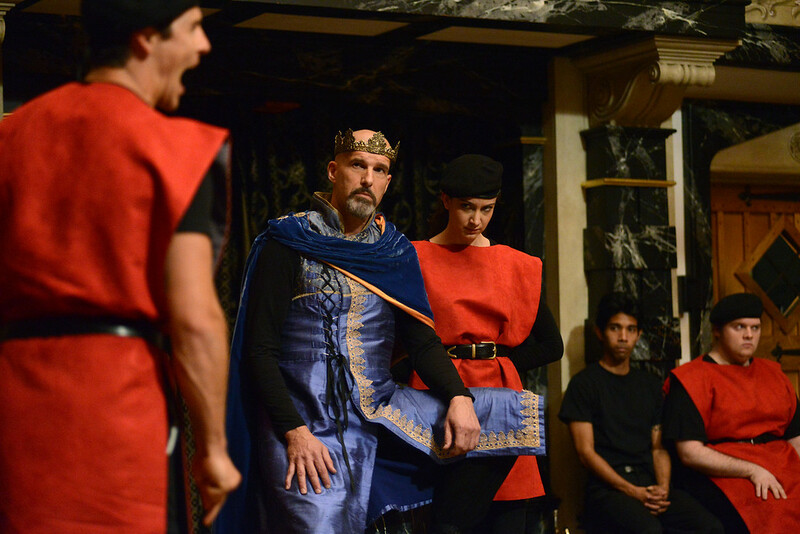 Rick Blunt in HENRY IV, PART 1. Photo by PAT JARRETT. 2014. 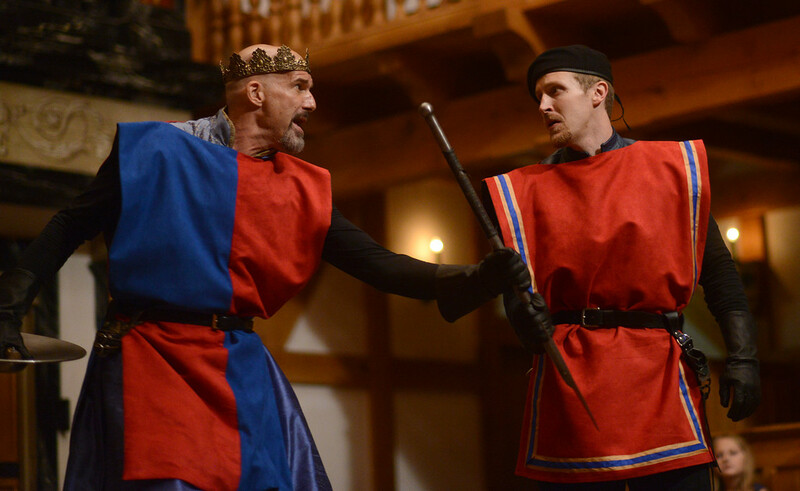 David Millstone and Patrick Earl in HENRY IV, PART 1. Photo by PAT JARRETT. 2014. 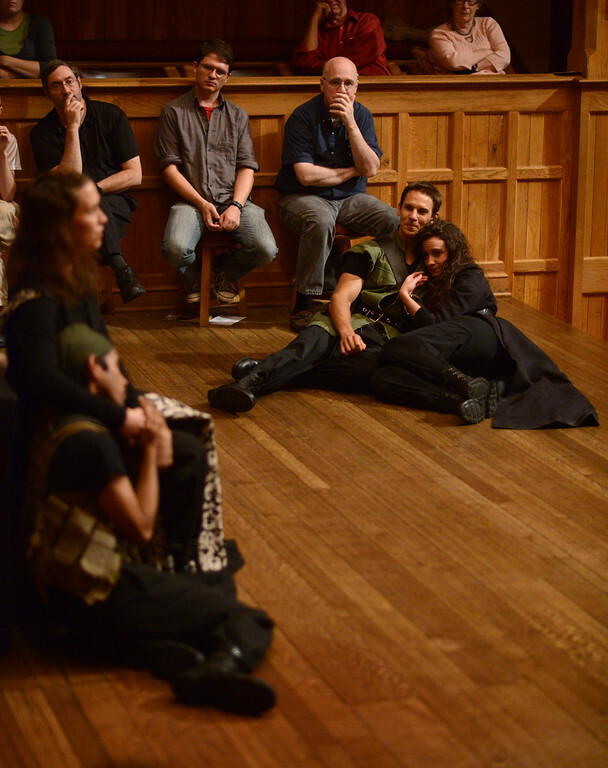 Patrick Midgley and Stephanie Holladay Earl in HENRY IV, PART 1. Photo by PAT JARRETT. 2014. King Richard II yields his crown to his cousin, Bullingbrook, making him King Henry IV. King Henry sends Richard to Pomfret castle where he is eventually killed by Henry’s supporters. At the close of Richard II (the play chronologically preceding Henry IV, Part 1), the newly enthroned Henry IV promises to make a penitential trip to the Holy Land. King Henry meets with his advisers to discuss his proposed crusade to the Holy Land, but the discussion turns to new battles on England’s northern borders. In the north, England’s forces have prevailed over the Scots, but the young English nobleman Harry Percy (Hotspur) won’t turn over his prisoners to King Henry. The King mourns the wanton behavior of his own Harry, his son, the Prince of Wales. The King puts off the crusade and calls a meeting with the Percy family. Away from court, Prince Hal and Sir John Falstaff taunt each other after a night of drinking. 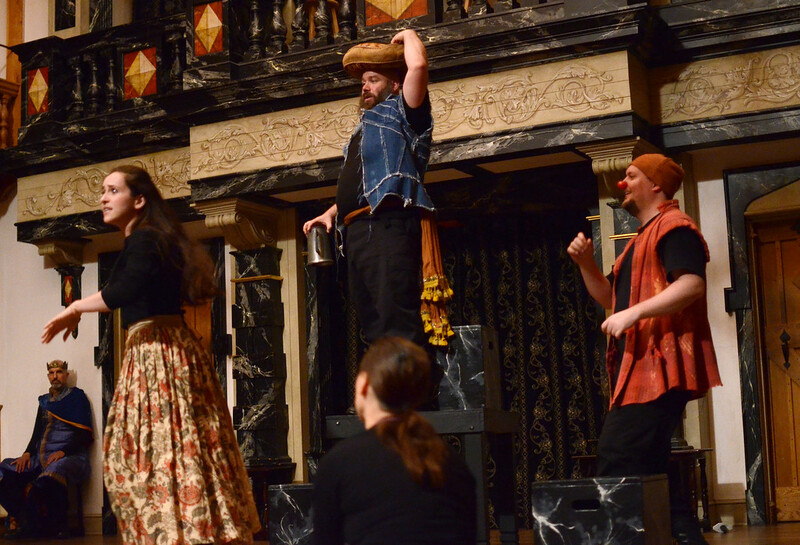 Their cohort Poins attempts to enlist them in an upcoming robbery; after Falstaff leaves, Poins persuades Hal to rob and embarrass Falstaff; after Poins leaves, Hal tells the audience his plans for the future. King Henry meets with Hotspur, Hotspur’s father (Northumberland), and Hotspur’s uncle (Worcester) to demand that Hotspur give up his prisoners. Hotspur agrees to do so only if the King will ransom Mortimer (Hotspur’s brother-in-law) from captivity in Wales. The King refuses. Hotspur’s family members agree on a plot to depose the King that involves Douglas (a Scottish warrior) and Glendower (a self-proclaimed Welsh wizard). 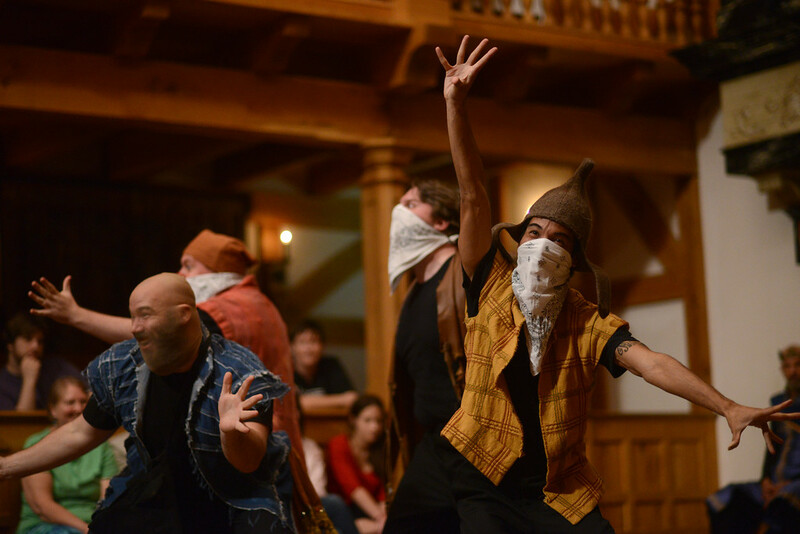 Falstaff and his confederates (Peto, Bardolph, and Gadshill) rob some travelers and are, in turn, robbed by the disguised Prince Hal and Poins. Hotspur reads a letter from a nobleman who refuses to join the rebellion against King Henry. Hotspur’s wife (Lady Percy) asks Hotspur what’s troubling him. In Wales, the rebels plan their campaign against the royal forces and discuss the division of the kingdom they have yet to win. Honor, cowardice, bravery, growing-up, and civil wars ensue. I have fallen in love with this extraordinary play many times for many reasons. Here are a few. to wash this blood off from my guilty hand,” ending R2 with a powerful (and perhaps unwarranted) guilt that haunts him through the next chapter in 1H4. I love how Shakespeare fashions Bullingbrook’s journey to give us a complex King at the top of 1H4 rather than just a hard-line father/ruler with a stick up his nether regions. rival, and the collision course they’re on makes this play perfect for required reading in every American high school today. Eastcheap. When Falstaff turns a joke-fest into something more serious by telling the Prince: “Banish plump Jack and banish all the world,” Hal responds: “I do, I will.” From his soliloquy about his future reformation to this foreshadowing of banishing Falstaff, the Prince is clear about how this buddy flick love story will end in Part Two of this saga. 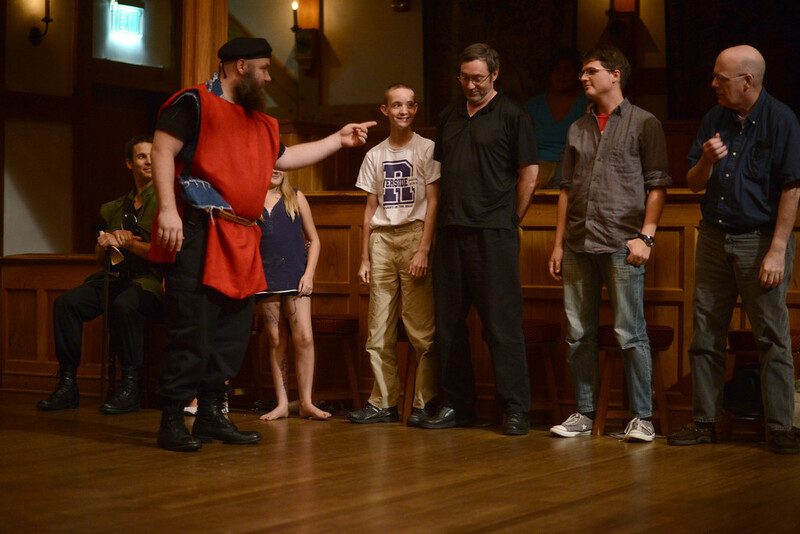 We hope you enjoy Part One of the Father, Son, and Falstaff.